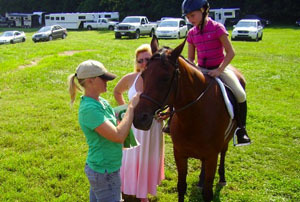 Five days of riding lessons and fun with horses for boys and girls ages 6 & up. Plus swimming, games & crafts. Camps for all levels of rider. 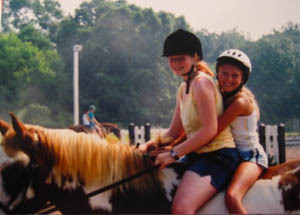 Includes a riding lesson, barn lessons, arts & crafts, games, and swimming each day. Small group instruction and individualized attention for every camper! There is a $25 discount for each subsequent week or sibling. Riding lessons will be in small groups, according to ability, for an hour each day. Beginners can expect to learn to control the horse at the walk, and begin to trot, post, and ride in 2-point position. More advanced riders will work on equitation and jumping. While the morning hours at our regular Summer Day Camp will be devoted to horses, the afternoons will be fun- filled with swimming, games, free-swim in the pool, crafts, board games and sports. 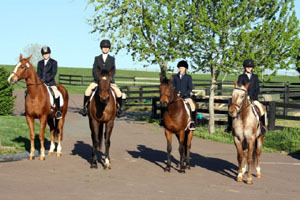 On Friday afternoon students will participate in a horse show for friends and family. Barn activity is a time for the children to learn about horsemanship. Throughout the week we will learn about horse safety, the parts of the horse, colors, brainding the mane and tail, cleaning & caring for tack and about the upper levels of riding. Boots or hard, covered shoes with heels. NO sneakers for riding. Safety helmets (Hard Hats) must be worn while riding. If you are signing up for more than one session, we suggest that you purchase an ASTM approved helmet, available at tack stores. We ask that campers bring a large, healthy, brown bag lunch. The camp will provide morning and afternoon snacks. Be sure to list any food allergies on the application form. 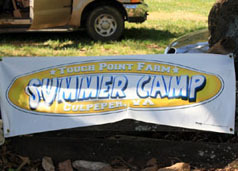 Our staff, in addition to Peter and Jan Schwenke (farm owners) and Meredith Schwenke Jones (farm manager and principle riding instructor), will also include two counselors, a barn manager and a certified life guard for 15 campers. Campers may bring their own horse to camp on a space available basis. Register early! There is no charge for Field Board. Full Stall Board is $125 for the camp week. Horses may be brought to camp on Sunday evening and stay thru close of camp on Friday. Individual arrangements may be made for weekends, multiple weeks, etc. Camp hours are 8 AM to 5 PM, Monday thru Friday. Campers may arrive no earlier than 7:45 AM and must be picked up by 5:15 PM. Extended Day hours will be available by pre-arrangement only. Extended Day starts at 7 AM and ends at 6PM for a fee of $5 for each additional hour.